Habit: Plant < 3.1 m; bulb +- erect-ovoid or oblique-elongate, scales segmented or not, longest 3--12 cm. Stem: brown-purple or not. Leaf: in 2--8 whorls, generally ascending, 4.5--14.5 cm, generally +- oblanceolate; margin generally wavy. Inflorescence: flowers 1--33(40), pendent. Flower: +- widely bell-shaped, not fragrant; perianth parts generally 5.6--9.5 cm, reflexed in distal 80%, orange or yellow, adaxially ridged basally; filaments diverging widely, anthers 11--19 mm, purple, pollen red-brown to tan-yellow; pistil 4.5--7.1 cm. Fruit: 2.5--5.4 cm, ribbed. Habit: Bulb scales often purple at tip, obscurely (1)2--5-segmented. Flower: perianth yellow or light orange, spots margined lighter red (toward tip larger, with wider margins); pollen +- tan or tan-yellow. 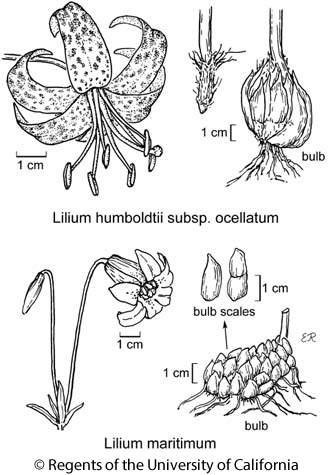 Citation for this treatment: Mark W. Skinner 2012, Lilium humboldtii subsp. ocellatum, in Jepson Flora Project (eds.) Jepson eFlora, http://ucjeps.berkeley.edu/eflora/eflora_display.php?tid=51253, accessed on April 24, 2019.
s CW, SW. Markers link to CCH specimen records. Yellow markers indicate records that may provide evidence for eFlora range revision or may have georeferencing or identification issues. Purple markers indicate specimens collected from a garden, greenhouse, or other non-wild location.